Our Sun Garden Feature Greenhouse is available painted Forest Green or Dark Brown in addition to White. 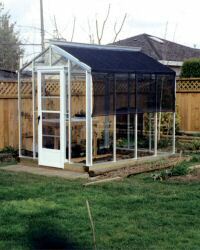 This greenhouse measures approximately 8' x 8' and is regularly priced at $3,547.00. It is offered at the sale price of $1,995.00 if painted White, and $2,495.00 if painted Dark Brown or Forest Green. For more info, visit www.backyardgreenhouses.com. 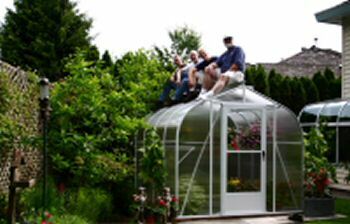 May is when you might notice a shortage of space in your greenhouse. In the typical greenhouse, you've got trays and pots of bedding plants, vegetables and herbs, just to name a few. Now's the time to get those seedlings into a cold frame to harden them off before planting. Remember to provide your plants with air circulation. 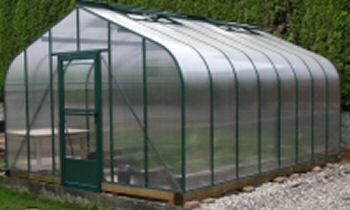 For most greenhouse growers, this is the time of the year when you need to pay careful attention to your greenhouse becoming too warm. Your main task is to ensure that your greenhouse stays below 80 degrees F.
Don't switch off your heater just yet. You likely won't need it during the day, but you could still experience frost at night. Hose down the greenhouse in the morning when the weather is sunny. This will benefit your plants in two ways. Firstly, it helps to cool down the inside temperature of the greenhouse. Secondly, it creates added humidity which your plants will enjoy. Your plants will require daily attention, especially when it comes to watering. Shelley Awad, the proprietor of Backyard Greenhouses is also a children's author. The first two books in the series have been released. The first mysterious adventure is Dan Delion's Secret, and the second is Ghost Walk. The Greenhouse Kids are named after flowers and plants, and also share the same traits. That's why Dan Delion is growing like a weed and he has spiky blonde hair. They meet a magical ladybug who teaches them life lessons. Ghost Walk is a continuation of Dan Delion's Secret. For more info, or to order the books, visit www.greenhousekids.com. To view the book trailer, please click http://www.youtube.com/watch?v=5huvuy3Lg-s.